Ok. This is cool. Absolutely cool. 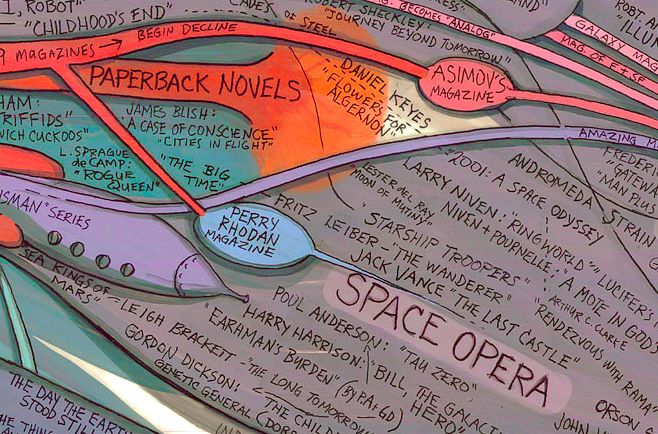 Artist Ward Shelley has sketched out a mind map to the history and evolution of the science fiction genre. It’s amazing. Click through to the big image and check out the areas around cyberpunk (upper right-ish) and the “Star Wars effect” (follow the arrow from Star Wars). He used spatial relations too. So the closer a name or title is to a sub-genre the more “canon” it/they will be. Pretty cool way to pick up new titles and authors to track down. Someone should do this for all of the genres. A biblio-mystery mind map would be cool. I’ll buy the colored pencils! Who’s with me? This is one of the few “book videos” I really enjoy. I still haven’t found video promos or book trailers to be that appealing. But this one produced by the New Zealand Book Council is phenomenal! It is a book video worth watching, all the way to the last page, where the letters walk off of the page. Fantastic! The video is taken from Maurice Gee’s Going West.